Made of strong biaxial polyester. 1. Avoid of any oxygen shortage accidents in the restricted air supply spots during municipal sewer servicing, underground cable maintenance, tunneling and subsurface repairing. Or exhaust the remaining hazardous gas and flammable explosive gas. 2. To supply fresh air into large-diameter steel pipe, container, fermenter, granary which are poorly ventilated. 3. To supply fresh air to the poorly ventilated spaces such as ship's hold, crypt, storeroom, freezer and refrigerated container. 4. Exhaust the welding waste gas, fume, hazardous gas, dust and hot air causing by ship building and maintenance and manufacturing production in bad air environment. Create a comfortable working condition. 3. 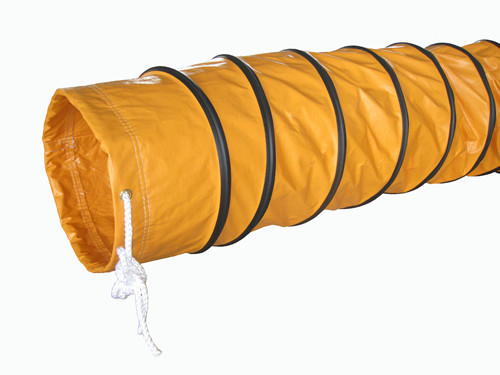 Can carry liquids, air, fuels, and the absorption and drainage of powders and dust. KOP has 15 years experience in inflatable products. Professional R&D team: Best design according to your demand, and 3D drawings for you to confirm before production. Professional Automatical cutting manchine: Make sure high effciency and accurate cutting which is an important guarranty of type and apperance. Professional printing machine: 6 color HD printing, imported oil ink with bright color, stable and accurate. Professional inflatable sewing machines: Use 12 lines high strength bundy line, contolled by experienced techinc workers, double stitching and good stitch length, make sure products sewing strong and durable. Professional coating manchine: Automatically coat all the printing with a protection layer which can protect the printing in good condition in long time, no scratch, no color fading, no mess.